This Saturday will be the first meeting of a new study group. The group might be new but the concept we will be exploring is an old one. Small family farms were once the center of village and town economies, providing essential products, from food, to medicine, and yes, to clothing, bedding and household linens. As time went on, the small family farms were replaced by large corporate farms and the production of finished goods was taken over by factories. The general population became further removed from not only where their food was produced but also where their clothing and yard goods came from in the name of convenience. Along with convenience came ignorance. We didn’t know what pesticides were used, how labor was compensated, whether or not there were good environmental practices used and the cost of transportation incurred. We are coming to terms with food, with buy local campaigns and new purpose for the small family farms in the area of food. But what of fiber? There are small wool producers and the beginnings of flax production and a little cotton production. And long after the exodus of many of our large fiber mills, we have small cottage mills that clean, card and spin yarn. But so little production of an end product like yard goods and clothing associated with the farm. 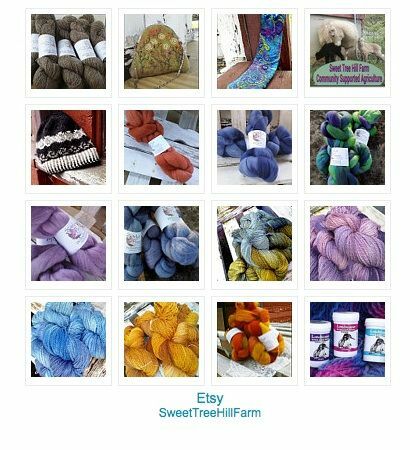 As a grower of wool, I thought a way to support the farm would be to cater to knitters and Handspinners, providing only roving and yarn. But as a business model and of providing an essential product to the general public, it was lacking. And then I started looking back in history and the role of wool and flax farms in clothing production and a spark emerged. Why not come full circle like the food production farms? 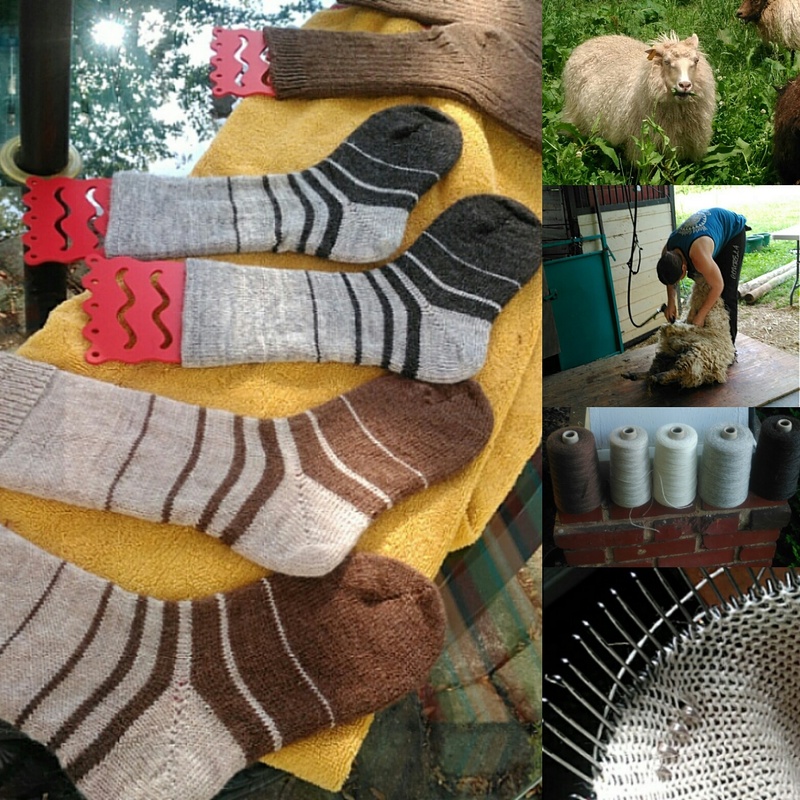 Why not explore the idea of local clothing production centered on fiber produced on the small farm? It is daunting, as the knowledge of processing and producing with old skills is evaporating. And in order to produce actual clothing, there probably needs to be an effort to co-op materials, tools, processing equipment and labor. And again, we can look back and see that this was, in fact, done in earlier days here and in Europe. So as we explore the possibilities, we can grow communities around fiber production. And maybe bring together a network of all those so called hobby farms out there. I am excited about this effort. We will keep fiber heritage alive, teach through example and take small fiber production to an end product… To clothing. For my little part, I have chosen socks to be a clothing product produced from fiber grown on my farm. These socks are not from pooled fiber from many farms and then knitted in a factory like what is offered by many wool growers at markets. But instead, the wool is washed and spun into yarn at a small cottage farm mill, and I take that yarn and knit the socks on a 100 year old sock machine right on the farm where the wool is grown. And as I learn about other fibers, such as flax and cotton, I will be growing and experimenting with these fibers. And there are plans for making the farm a teaching farm where folks can witness and learn fiber production skills. 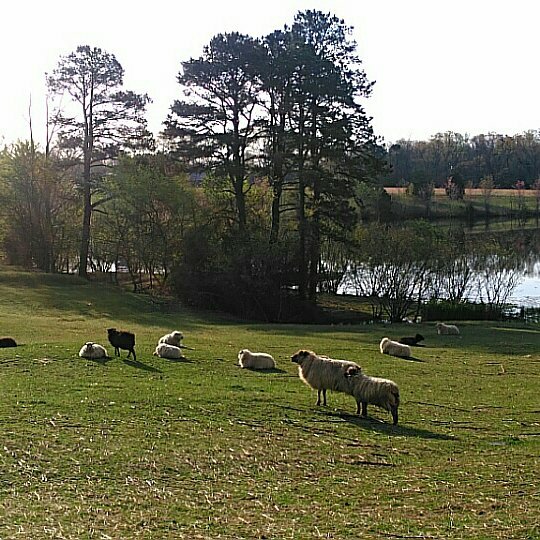 So the first meeting of our little study group will be this coming Saturday at Sweet Tree Hill Farm. Send me an email for more information if interested in learning more about our efforts. It’s an interesting initiative and I hope that it will be possible to successfully carry the project on.